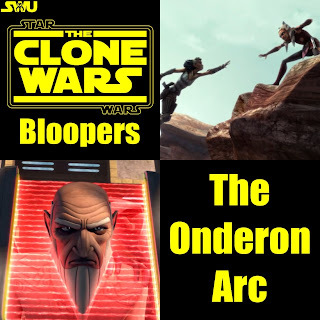 Here it is, finally, Clone Wars Bloopers for the entire Onderon Arc, and the very first edition of CWB on the Star Wars Underworld! First off, throughout the episode the Tanks that are guarding the gate into Iziz change position. Not horizontally, but vertically. First, in the scene where the Droid squad is dispatched to attack the Rebels, you can see in the establishing shot that the Tanks seem to sit on the ground instead of floating above it like they normally do. But just a few seconds later they are floating. And later when the Jedi & Rebels arrive the Tanks are back on the ground. But when they get near the gate the Tanks are floating... again. When the Droids begin attacking the Rebel's camp, Anakin tells Obi-Wan, "I'll take the left flank if you take the right!" But Obi-Wan responds "No, Anakin. We can only protect them. We cannot fight this war for them." But later, when the Tanks arrive, Obi-Wan tells Steela "We'll handle this!" Wait... I thought you just said you couldn't fight?! At first there appears to be only one squad of droids. But just when the Rebels set off their Droid popper bomb another squad appears out of nowhere. And later, once the Rebels dispatch the second squad of Droids and the Droidekas arrive, the street is littered with only a hand full of dead Droids. Not hear as many as the Rebels blasted. But it is in here. I'll give them this one, it could just be the lighting. First we start out with five B-1 Battle Droids guarding the entrance to the Power station. Steela fires several shots and destroys three of them on screen. When they begin marching and firing towards Steela, the three blasted Droids can be seen laying in a pile, but there is still at least four Droids standing. Steela then destroys one of them. But later even more appear. Towards the end of the episode, after King Rash says "Ready weapons", the Magna Guards assume an attack position to strike the laser-guillotine(Or whatever it's called). But when Steela is lifted up to blast the Droids they are standing in their normal position. Also, when Saw is first brought in to the square with the King and during their first escape attempt, his hands are cuffed in front. After he is recaptured and taken back up onto the steps with Steela and the others, his hands are still cuffed in front, but only briefly. In the next shot his arms are now behind him. It changes back when General Tandin and his men arrive. Next, during their finale escape, the overhead view shows only Tandin and his men backing away from the Droids. But when the Camera moves amongst the crowd, Steela and the others are just then at the front of the crowd pushing their way through. And later when the Nest is attacked. If you enjoyed this edition of Clone Wars Bloopers please share it with your friends. Special thanks to Ruari & Dan for spotting several of the mistakes featured here. If you have noticed bloopers yourself, or perhaps I made a mistake, please say so in the comments below, or via email: swunderworld@gmail.com | Subject line: "Bloopers". These episodes were... meh. Visually and acting wise the Clone Wars is always top notch, but I didn't find myself invested in this story much at all. A War On Two Fronts was relativity boring, an episode focused almost entirely on military training definitely wasn't the best idea TCW writers have given us. Fronts Runners seemed a bit too drawn out. Great action sequences but it did little to further the story. The Soft War was a step up from the last two episodes. The climax was especially pleasing. Tipping Points was the strongest of the four. The battle scenes were very well done and thrilling. Hondo's appearance was great, thus connecting Revival and the following Young Jedi Arc to this Arc. And a gut wrenching ending topped it off. Overall, I give this Arc an 4.9/10.